The scene is divided into five registers: The first register (triangular gable) depicts a scene with the King Father of the East sitting in the middle, accompanied by winged immortals and other sacred beasts. The second register (from left to right) illustrates stories of the virtuous woman of the capital, the righteous stepmother of Ch'i, the virtuous aunt of Liang, and wife of King Chao of Ch'u. The third register (from left to right) illustrates the filial grandson Yüen Ku, the filial child Chao Hsün, Wei T'ang, the filial Elder Yang (Yangkung), and the filial men from three counties. 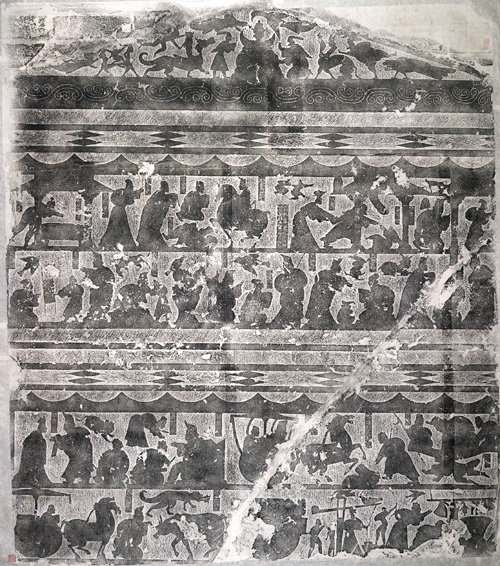 The fourth register (from left to right) depicts the stories of Chungli Ch'un, Nieh Chê g's assassination of the King of Han, Yü Jang's failed assassination of Chao Hsiangtzu, and Yao Li's assassination of prince Ch'ing Chi. The fifth register illustrates a woman using a device for drawing water, and a food preparation scene.